You had me right up until the very end… I like my socks made up of a fine yarn. I find the worsted weight almost unwearable. The Joy of Sox is awesome. That’s really all I have to say about the matter. 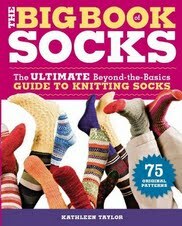 I like sock pattern books with pictures, too. Looks interesting though. Have you seen Queen Kahuna’s book? I think it is called Crazy Toes and Heels. You can use any yarn, any needle, any gauge, any foot size with her one formula. Her website is kinda scary-hard on the eyes, lol: http://queenkahuna-creations.com/ They can be knit toe up or top down. Toe up is kind of nice cuz you can try it on as you go.